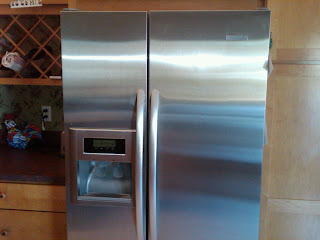 Ahhh... new kitchen appliances, what can do more to bring new life into a tired kitchen...? The type of purchase that you make just a couple times over the course of your life. So you try to chose wisely, go with a brand that not only adds a touch of class to your kitchen, but that will perform well. Shortly after buying my home, I decided that new appliances would add great value to my kitchen, aesthetically and otherwise. I went the route that is so common nowadays and went for all stainless steel. Now the very top brands were out of my budget, not to mention unrealistic for the price range of my home. But I chose KitchenAid, as I believed in their brand, and I suppose had bought into and believed their marketing campaigns. KitchenAid, that's a good brand right? It's certainly not at the bottom of the appliance food chain. So after much debate, I purchase a new slide in range, microwave, dishwasher and side by side refrigerator. The cost, almost $5k. They look lovely. Too bad I actually have to use them. My side by side refrigerator has an ice dispenser in the door. Yeah! This was a new feature for me, but unfortunately, I can't get it to dispense ice. After the repairman visited, I was told that it is common problem with this brand. The dispenser trap door lets enough warm air into to partly melt the ice... and once this happens it will no longer dispense ice, because all the ice freezes into a giant lump inside. We live without ice now, because I am not strong enough to break the ice container free (I stopped trying after I was yanking on it, my hand slipped and I punched myself in the face). My dishwasher is kind of crazy... usually you can open a dishwasher's door add an item and when you close the door it resumes... not the KitchenAid. You have to push buttons to get it to restart... why? My dishwasher does not drain the water out when the cycle is done either. I have to push the cancel button and then the bottom of the dishwasher will drain. My dishwasher smells bad and so do my clean dishes when I unload them. Last night I cooked salmon and later ran the dishwasher with the plates from dinner. This morning I opened up the dishwasher and about gagged. Everything smells like dirty salmon water at the bottom at the dishwasher.... lovely. My oven has the touch panel controls on the front. This is ok, I guess. But when the kids go to use the microwave and lean up to push the microwave buttons, the oven control panel is activated turning the oven on. Not exactly what you want to happen when the kids are trying to fix popcorn. 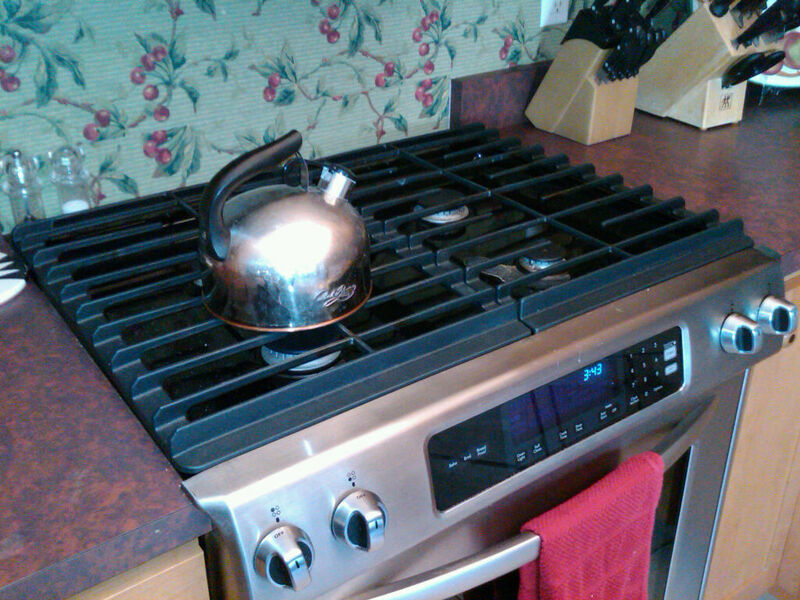 But the worse part is the gas range top. It looks great. 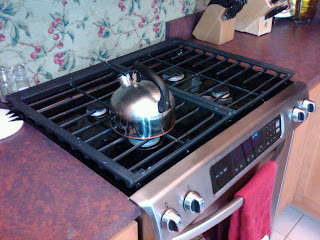 But I have never used a gas range that took so long to do anything. I swear it takes 30 minutes to boil water. This is an $1800 range. It occurred to me that the problem must be that the grate is too high, and too far away from the actual flame. How did this get missed in KitchenAid's R/D department? I have now turn the grates upside down so the bottom of the pans are closer to the flame. it looks like crap, but at least I can feed my children before they pass out from hunger. My microwave automatically turns on the fan if the cook top below produces a certain amount of heat. Not a bad idea, I guess. But it is extremely irritating that you cannot turn it off if you want to. It turns on by it's self and it will turn off when it is ready to. You can not override it - and my table is in the kitchen and it is very noisy to try and eat and talk with the fan in the background for another twenty minutes after you are done cooking. Well - what's my point with all of this...? That's a fair question. I suppose to give people a heads up when considering any sizeable purchase. Just type in Google the brand name and the word "problems". When I recently typed in KitchenAid Problems... I was shocked at what came up. Lots of poor souls just like me that gave a manufacturer the benefit of the doubt... and wound up with the short end of the stick. If you have your own problems with KitchenAid - please post it here and perhaps we can help other avoid making a costly mistake. while the stove looks quite attractive, it seems that the heat would dissipate from not being focused on the space above it where you put the pot or pan you are using to cook. It does seem odd. My journey of healing after being diagnosed with stage 3 breast cancer at age 40 after deciding that the traditional cancer treatment, chemo, radiation and hormone therapy were not right for me.